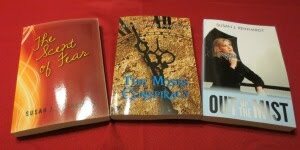 Christian Writer/Reader Connection: My Reference Shelf - Writing for Life by Karen Lange - GIVEAWAY! My Reference Shelf - Writing for Life by Karen Lange - GIVEAWAY! The Author: Karen Lange is a homeschool veteran and consultant, freelance writer, editor, and online writing instructor for teens and adults. 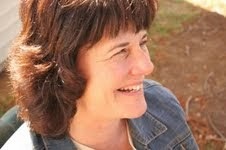 Her articles appear in parenting, homeschool, and other publications. Homeschool Co-ops 101, her first book, was released in 2013. She and her husband homeschooled their three children for grades K-12 in southern New Jersey. They now live in north central Kentucky where Karen enjoys reading, walking, and playing with her grandson. She is a fan of dark chocolate, hockey, and historical fiction. This book offers ready to use lessons for grades 7-12 that guide students through the process of writing the research paper. Suitable for homeschool families, co-ops, or other student groups, these eight lessons break down the process from start to finish with helpful instruction, encouragement, and practice. As always, I'm so impressed with Karen's thoroughness and knowledge. The research techniques are valuable not only for doing papers, but also for those writing novels or non-fiction pieces. I wouldn't limit this book to teaching teens. Karen includes great Time and Stress Saver Tips. All in all, I'm keeping this on my Reference Shelf. It's a great resource. You can connect with Karen on her Amazon Author Page. 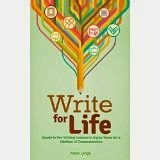 Giveaway Information: One winner will receive a $10 Amazon Gift Card and a copy of the Write for Life ebook. Disclaimer: The author provided a copy of her book for my honest review. I did not receive any payment. All opinions expressed in the review section of this post are mine alone. Writers: What topics from your school days would you like to revisit? Please share. Readers: Do you purchase how-to books for yourself or your kids? Please share. Thank you so much for hosting a stop on the tour and for your kind review. I am glad that you think it is a valuable resource. I hadn't initially thought of it as a resource for us writers too, so I appreciate you making that point. Thanks again for your support! I love it that Karen is sharing her ideas about teaching writing! And, Susan, thanks for always sharing interesting people and ideas on your blog. I wanted to stop by just to say how happy I am for Karen and that her book looks great. I'm sure it is packed with knowledge. Thanks for stopping by! Hope you get a chance to read the book. I value your input; it is an encouragement. Thanks so much! Sorry I'm late responding to all of you. Yesterday got away from me with various crises. Thanks, Karen, for including me in your blog tour. As you can see from my review, I'm a fan! Thanks to all those who commented. I know you'll gain much from this book.